Ratings Results of Interest: Continuing a pattern we have been seeing with second season shows this year, Freeform’s Cloak and Dagger returned this past Thursday with ratings down notably from its inaugural run. We have already seen significant drop-offs for shows like The Orville (FOX), American Gods (AMC), Happy! (Syfy), and Siren (Freeform), and Cloak and Dagger appears to be continuing that trend. The show had a two-hour debut on Thursday and posted 0.15 rating based on same day viewing for the 18-49 demographic with 477K total viewers for the first hour and then slipped to a 0.11 rating with 399K total viewers for the second hour. That is down from the 0.29 rating the show had for its series debut last year and also from its 0.21 first season average. It’s too early to raise the red flag on this one just yet, but I will keep a close eye on how it tracks in the coming weeks. On Sunday, A Discovery of Witches had its linear debut in the States on AMC and posted a 0.17 rating with 853K total viewers. Those are not spectacular numbers, though the total viewers are decent for a cable series. This one has already been available on the Shudder and SundanceNow streaming services and it has already been renewed through a third season by Sky One in Britain, so this is just a chance for AMC to attract more viewers to the series. Over on Starz, American Gods slipped to a 0.08 rating with 306K total viewers and it is looking like next season could be its last. On Wednesday, FX’s What We Do in the Shadows improved for its second episode by almost 30% as it posted a 0.27 rating with 658K total viewers. If it stays above the 0.20 level, I believe it has a decent chance of surviving into a second season. It was sad news for Syfy’s Happy!, though, as that one slipped to a 0.09 rating with 286K total viewers. I already had that one On the Bubble and fans need to stage a Call to Action on the social nets to bring it some attention. On Monday, The CW’s Legends of Tomorrow returned from its extended hiatus but only posted a 0.2 rating with 916K total viewers. That show has already been renewed for a fifth season, but it is looking increasingly like that could be its last. Over on Freeform, Shadowhunters improved slightly to a 0.13 rating with 367K total viewers, but that will do nothing to change the network’s mind about the cancellation. Call to Action: Several sci fi and fantasy shows are struggling as we head into the final months of the season and several more have already been cancelled. But as we have seen the last few seasons, a strong outpouring of support from fans can convince the networks to change their mind about the cancellation or at least produce a series finale (i.e., Timeless and Shadowhunters) or sway other venues into picking up these shows (i.e., The Expanse and Lucifer). Among the shows currently in need of support from fans are The Orville, Deadly Class, Siren, Origin, Wynonna Earp and more. You can see the full rundown of our Call to Action shows at this link. News Roundup: AMC’s Preacher will be ending with its upcoming fourth season according to executive producer Seth Rogen. But that network has another genre entry in the works as they have announced a second spin-off to The Walking Dead which is expected to debut in 2020. The CW’s The 100 could have a spin-off on the way according to that show’s creator and showrunner. And Snapchat is expanding its scripted originals with multiple new show on the way which includes several genre entries. Arrow (CW, Status – Renewed): This show has been renewed for an 8th season and that will be its last. Expect it to wrap up with next season’s Crisis on Infinite Earths cross-over event which will bring major changes to the Arrow-verse. Cloak and Dagger (Freeform, Status – Renewal Possible): This show returned for its second season with ratings notably lower that its first. It may make up some of that with delayed and digital viewing, and Disney owns both Freeform and Marvel, so it could still be okay. But a Call to Action from fans on the social nets could definitely help give it a boost. 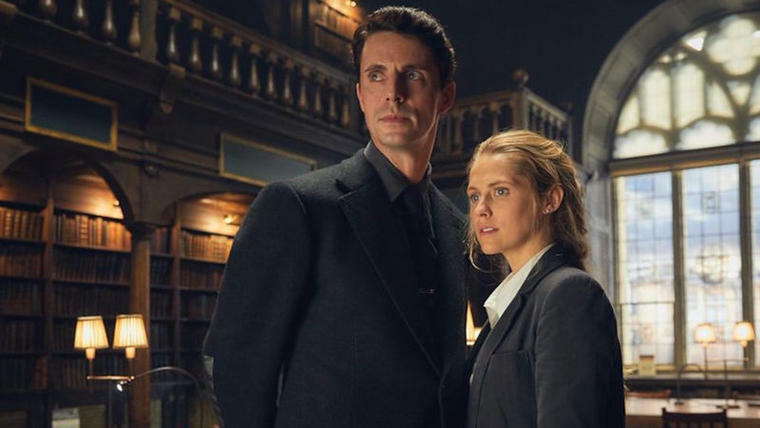 A Discovery of Witches (AMC, Status – Renewed): The linear debut numbers for this show were not great, but it has already been available on the Shudder and SundanceNow streaming services and it has been renewed through a third season by Sky One in Britain. Happy (Syfy, Status – On the Bubble): No happy returns for this one as its viewership is well below its first season numbers and I am starting it out On the Bubble. Fans may want to make a Call to Action on the social nets to see if they can bring more attention to the show and help it out. Into the Badlands (AMC, Status – Cancelled): This show returned with its best ratings since the beginning of its third season with the help of a lead-in from The Walking Dead, but it did drop notably after moving to its regular Monday timeslot. If fans can stage a Call to Action on the social networks and make enough noise, perhaps they can convince AMC to change its mind about the cancellation or another venue to pick the show up. The Orville (FOX, Status – Renewal Possible): The numbers are down for this show in its regular Thursday timeslot, but it continues to perform well in Live+7 delayed viewing like last year. As a marginal performer, though, it could get swept out with any house-cleaning that might follow from the Disney buyout unless the Mouse House recognizes the franchise potential of this property. Fans should certainly take to the social networks at this point with a Call to Action to bring the show more attention and give it a boost. Roswell New Mexico (CW, Status – Renewal Possible): This show’s numbers have been down the last few weeks but that is in part because it has been flying solo more often than not with its lead-in The Flash preempted or in repeats pretty regularly of late. If Roswell is doing well in digital viewing, that could make up the slack and help it get to a second season. Siren (Freeform, Status – Renewal Possible): This show started its second season with decent debut numbers, but then saw those slip somewhat. I don’t count it as a Bubble show just yet, but it could benefit from a Call to Action from fans on the social networks to bring it some more attention. It returns from hiatus on July 11th. Supernatural (CW, Status – Renewed): As expected, this series has been renewed for a record-busting 15th series, but it will finally be coming to an end with that announced as its final year. More on that at this link. The Walking Dead (AMC, Status – Renewed): The post-Rick Grimes era has been well-received by fans and critics, but it has not led to an improvement in the ratings for this show. Still TWD continues to rank as the top scripted series on cable and also outperforms most broadcast network shows. It has been renewed for a tenth season and I expect it to stick around for at least a few more years. What We Do in the Shadows (FX, Status – Renewal Possible): This show debuted with modest ratings, but improved notably with its second episode. It’s numbers look good enough for a comedy series on one of the cable networks, and if it does not slip too much in the coming weeks it could survive to a second season. Deadly Class (Syfy, Status – Renewal Possible): This show got off to a decent start, but then saw its numbers slip in subsequent weeks. But it still did okay overall for a Syfy entry, especially with its delayed viewing numbers, and the network’s parent company NBC Universal has an ownership stake in the show. It has a chance at coming back for a second season, but fans may want to make a Call to Action on the social nets to give it a boost.